Any great San Diego vacation includes stop at Belmont Park. History, sunshine, and amazing waves all come together to define Belmont Park, a hidden gem of San Diego. This amazing oceanfront park located in Mission Bay originally opened in 1925, and some of the park’s original rides are still operational today. Don’t think that this fun place is stuck in the past. Over the years, it has expanded with many new rides, activities, and its famous wave machines. 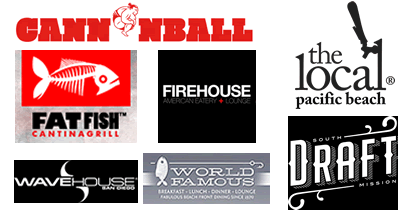 It also includes tasty eateries and some beach-related retail shops. Belmont Park is the perfect place to spend a San Diego day. Belmont Park was originally developed by John D. Spreckels, a wealthy businessman, as a way to help Spreckels sell land around Mission Bay. The park originally opened in 1925 and still attracts millions of people almost 90 years later. Amazingly, some of the rides from the original park are still operational today, including the Giant Dipper, a wooden rollercoaster, and The Plunge, an indoor swimming pool. 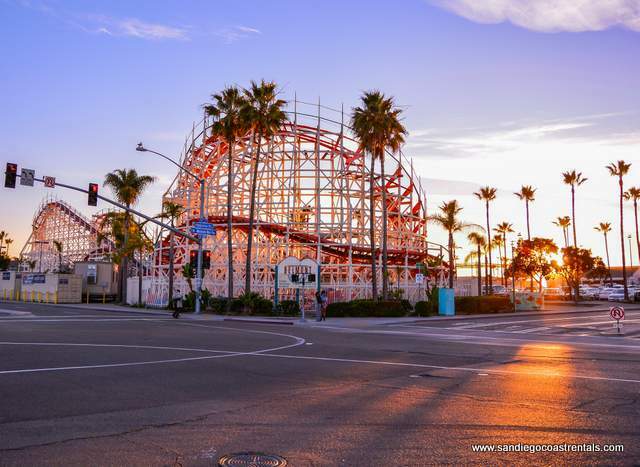 The Giant Dipper is listed on the National Register of Historic Places. Today, children can ride virtually the same rollercoaster that their great grandparents could have ridden in 1925! Today, Belmont Park has greatly expanded with many more attractions. Most visitors come to Belmont Park for the rides, including the historic Giant Dipper roller coaster. Other fun rides include the Beach Blaster, which swings passengers 60 feet into the air, the Octotron, a dizzying spin ride, Krazy Kars bumper car ride, the Vertical Plunge, and the iconic Liberty Carousel. If you want to try out all the rides, adults can purchase an unlimited day pass for $26.95. Children under 48” pay only $15.95. The fun doesn’t stop with rides. Belmont Park includes great attractions that kids will enjoy, like Tiki Town Adventure Golf, the Sky Climb rock climbing wall, a big arcade, and the Sky Ropes obstacle course. Each attraction charges its own fee for participation. One very unique feature of Belmont Park is its two popular wave machines, The FlowBarrel and The FlowRider. The FlowRider uses patented sheet wave technology to create waves that riders of all skill-levels can enjoy. It’s a great way for new surfers to develop their surfing skills. Passionate surfers will want to head directly to The FlowBarrel, which provides a perfect tubing wave for lots of great surfing practice. This wave machine produces a continuous 10-foot. You can rent either The FlowRider or The FlowBarrel for an hourly fee. You’re bound to get hungry during your time at Belmont Park. Luckily, the park includes a variety of sweet shops, casual eateries, and restaurants. Start the day off right with the North Shore Café, which the Belmont Park website claims is the best breakfast on the beach. For a tasty lunch, head over to Belmonty’s for burgers and pizza. If you want more of a restaurant experience, then choose the Five Star Grill or Cannonball, the largest oceanfront sushi rooftop restaurant in San Diego. Of course, no amusement park experience is complete without some delicious treats. The Sweet Shoppe provides huge ice cream cones and candy for the kids or kids-at-heart. 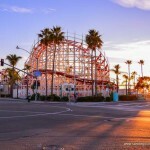 Belmont Park is a must if you are vacationing with your family in San Diego. The kids will have a blast, and so will you at this historic and enjoyable park in Mission Bay.